Dennis J. Gallaher shows how the peace, rest and comfort of God can be lived out in today’s stressful world that goes faster and faster and more out of control. 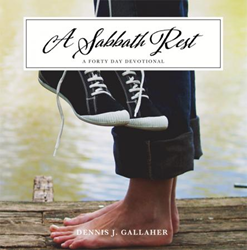 Dennis J. Gallaher’s new book, A Sabbath Rest - A Forty Day Devotional, ($11.99, paperback, 9781498465960) is a biblical and practical plan that leads the reader back to what was lost in the Garden, the gift of rest. According to the author, the loss was great, but God has an answer, a healing that He continues to offer through Jesus Christ. Gallaher believes the Sabbath is that answer, specifically “a Sabbath rest for the people of God.” He explains that Sabbath is not a break once a week, a vacation, or a “mental health day.” Sabbath is a lifestyle that must be entered into with diligence and obedience. He encourages readers to go back to the Garden and resist the drumbeat that signals business as usual. He wants all to enter the Father’s world where He rested from His own work and sit with Him to experience Sabbath rest, Shabbat menucha, for the soul. This devotional reveals a thought-provoking plan to restore the seventh day in the life of every reader. For the past thirty years, Dennis J. Gallaher has cared for the washed up and the worn out. One of the single most important lessons he has learned is to trust God's Word and enter into His Sabbath. Xulon Press, a division of Salem Media Group, is the world’s largest Christian self-publisher, with more than 15,000 titles published to date. Retailers may order A Sabbath Rest - A Forty Day Devotional through Ingram Book Company and/or Spring Arbor Book Distributors. The book is available online through xulonpress.com/bookstore, amazon.com, and barnesandnoble.com.